I recently took the plunge and recorded my first Facebook Live videos. Boy is that terrifying?! There is so much to consider: eliminating background noise, remembering what you want to say, getting the technology working, avoiding getting continually distracted from your topic by comments and saying hello to people. It’s tricky, but curiously addictive. I’m trying to do one every week now, and feeling like a pro (even though I’m definitely NOT one). But, I’m aware that lots of women know that recording video would be a great next step for their business, but are so confused about what to wear and getting their make up right that it puts them off altogether! One of my lovely friends, a professional photographer, told me that this issue puts people off getting their professional headshots done too. I’m often called in to advise clients on what to wear for getting in front of a camera. Sadly, this stuff is an important factor; when you show up in video you are representing your business through your personal image. It’s important to make the right impression because your audience will judge you, based on your appearance, in the first few seconds. And that’s long before they’ve had a chance to hear what you’ve got to say. Your work will determine whether you need smart, professional attire, cool casual or something in between. Dressing in a way that is exactly right for you makes ALL the difference. When you feel comfortable and authentically ‘you’ this will come through to your audience. You will be able to deliver your content naturally, and your viewers will enjoy watching you more. There are a few useful guidelines to stick to when you are committing your personal image to film FOREVER. So today I’ve got a checklist for celluloid greatness, so that if you are one of the people avoiding video simply because you don’t what to wear, you can move forward with your project and start worrying about how to smile while talking instead. It’s SO important to know which colours are flattering on you. Choose the colour you wear carefully. Make sure it complements your eye colour, hair and skin tone. Warm colours – those with a hint of yellow, or cool colours – those with a hint of blue. Deep strong colours, or lighter, less intense ones. Vibrant shades, or, if they will overwhelm you, something softer that will allow you to be more visible. Black, white, bright orange and red can cause problems on video, so are best avoided. It’s usually best to stick to plain fabrics so that you take centre stage – rather allowing a print to clash with your backdrop or again, to overwhelm you. If you are determined to wear print (if your background is very plain), be aware that different prints suit different people. The scale of a print or its style dictates whether it suits you. Want to know how you work out if a print ‘goes with you’? You need this blog post. It’s a good idea to have a professional blow dry before a shoot, but this is hard to fit in and can end up costing a fortune if you are doing regular videos. Your clothing style will determine how ‘neat’ you need to be. If your best style is ‘natural’ then you will look better and more authentic with your hair in an unstructured and undone way. Just make sure it’s not distracting. If you are having photographs rather than a video taken, remember that it’s relatively straightforward for the photographer to edit out any flyaway hairs as they are formatting your pictures. If you suit make-up and are used to wearing it, wear more than normal. Your usual light make-up could well look like you haven’t bothered on film. If you never wear make-up and don’t like the idea of changing your look for camera, go for a very light and natural make-up, to make you look more polished. You will likely still look as though you are bare faced in the final cut. Even if you don’t usually use powder, it’s a good idea to have some handy to touch up any shine that appears during your session, it’s hot work under the lights! The type of business you are in (as well as your personal style) will dictate the kind of outfit and accessories that are right for you. If you are being filmed, don’t wear noisy jewellery. Clashing bangles and tinkling necklaces are distracting and might be closer to the microphone than your mouth! If you work in a creative profession, incorporate your creativity into your outfit. Unusual jewellery can work well here, or prints, but see above. If you work in professional services – you need to look a bit more ‘together’, to give your audience a feeling of safety, that you are good with detail and reliable. Matching earrings and necklace can give a subconscious feeling of a person being organised. If you provide coaching services, aim for looking relaxed, approachable and warm (in the personality sense, rather than sporting a fur coat, see face shine above). 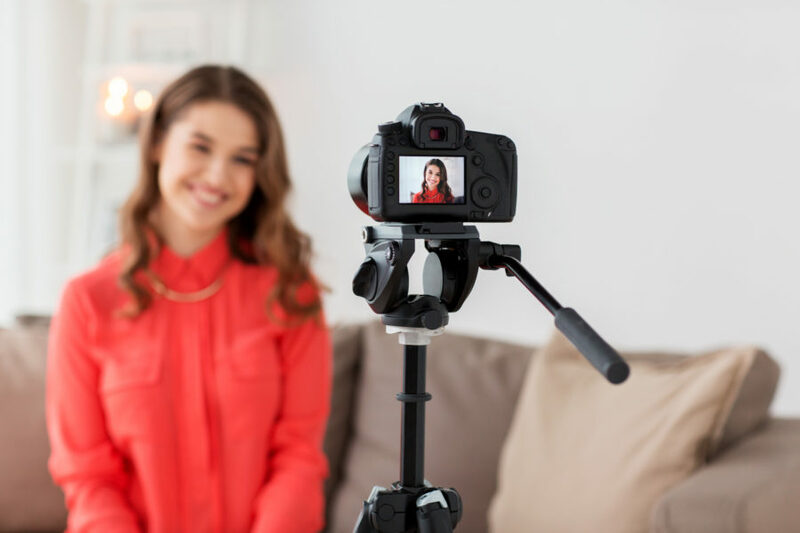 I hope these guidelines have given you some ideas for what you can wear on camera and if it’s helped you to get ‘unstuck’ about doing videos or headshots, that’s great! If you need more help though, I’m on the end of the phone, and I quite often work with clients to help them get this figured out. Just drop me a line: helen@helenreynoldsstyle.com to find out more.